ISO 10993-certified cyanoacrylate adhesives which are suitable for medical use. 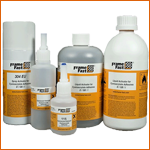 The standard of adhesives for screen printers, milling professionals and industrial filter manufacturers. Cyanoacrylates are semi-flexible rubber toughened for dynamic and temperature resistant bonds (up to 140 degrees). Vibration may cause such problems as self-loosening of threads. 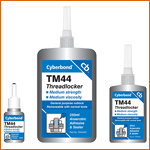 By applying the Cyberbond « T » series, this problem is solved. 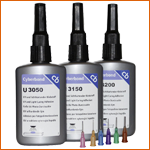 UV and light curing adhesives are designed to adhere to a wide range of substrates in demanding applications. 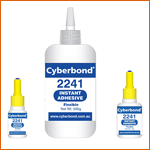 Cyberbond durably and reliably retains threads, shafts and bearings.